So you always wanted a REV’IT! Everest Jacket for the Gore-Tex Proshell and its durability, waterproofness and breathability, but your name is not Sven and you are not Euro slim. Well, guess what, the REV’IT! Poseidon Jacket is your answer. REV’IT! are going to hedge their bets and offer two Gore Proshell jackets, one for off road and one for Commuters/Long Distance Tourers. The Poseidon GTX is aimed at the latter and you get all the benefits of Gore triple layer Proshell which is bonded to the the outer-most layer. This means no more water logged, sopping wet, heavy jacket. Proshell enables your jacket to shed the water off and will dry much faster than those with drop liners. 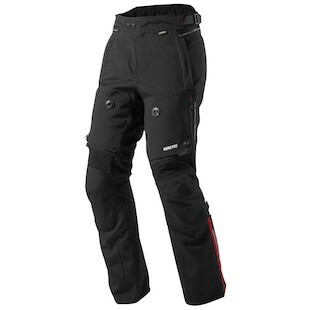 The other big improvement the REV'IT Poseidon GTX Jacket offers in addition to more American sizing (see videos on the Sand 2 for similar sizing) is the Aquadefence direct to body venting. On the REVIT Everest you had Gore’s Lock-Out vertical vents which offered direct to body venting, however as an Everest owner myself, getting the vents to stand open and allow air to flow through left something to be desired. The Aquadefence is a REV’IT! patent that started out on the Horizon Jacket and has been improved since iits introduction on this Jacket and Pant combo. For the Poseidon Jacket, it now uses magnetic fasteners to hold the vents open, yet allows you to close and seal the vent with one hand at the first sign of rain. On the jacket the vents are placed up high on the chest in the direct wind flow for most bikes. The REV'IT Poseidon Pants vents are located at the top of the knees. The surface area of the Aquadefence is far far greater than the previous generation using the Lockout zipper vents. These vents really work! 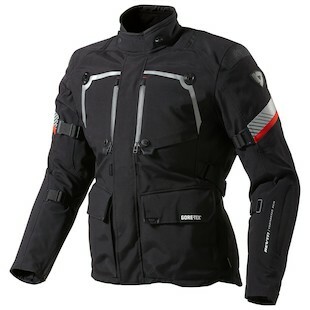 Full length removable thermal liners, SAS-TEC armor in the knees, elbows and shoulders, a pocket for the SeeSoft Back Protector and grip panel on the seat of the pants to keep you from sliding, accepts Challenger Cooling Vest and Hi-Viz Connector Vest - this jacket has all the bells and whistles! The REV’IT! Poseidon could truly be that 4 season suit you've always been searching for!